Surrogates is a high-concept science fiction action thriller set in a world where the human race has retreated to live in isolation from each other, and only interact through ‘surrogates’ – robots built to look identical to their hosts, and which are controlled by humans from the safety of their own homes. Bruce Willis stars as cop Tom Greer, who must venture out into the ‘real world’ for the first time in years when he gets involved in a murder mystery where surrogates and their owners are being killed. The film co-stars Radha Mitchell, Rosamund Pike, James Cromwell and Ving Rhames, is directed by Jonathan Mostow, and features a new original score by Richard Marvin. It’s been nine years since Marvin’s last major theatrical score – the submarine thriller U-571 back in 2000 – but he has nevertheless remained very busy in the TV world, scoring hundreds of episodes of TV shows such as Six Feet Under, The O.C., and Without a Trace. It’s nice to see him back on the silver screen, and kudos should go to director Mostow for maintaining his relationship with his composer: this is their fourth collaboration, following Breakdown in 1997, U-571 and the 2007 TV movie “Them”. However, I just wish his score for Surrogates had a little more sparkle, a little more life. It’s fun, and has a few interesting ideas and a couple of standout cues, but for the most part just comes across as fairly standard ‘filler’ action thriller music, with very little identity of its own. Written for an enormous 120-piece orchestra along with electronic elements, Surrogates certainly doesn’t skimp on size. The sound palette and depth of the performance is generally very good, but what lets the score down is its unexpectedly underdeveloped thematic core, and its overall feeling of ‘sameness’, as though you’ve heard most of it all before in other, similar scores. You hear composers like Brian Tyler, John Powell, Marco Beltrami and others writing this kind of music all the time, and with generally more successful and interesting results. The opening “Drive to Club” is a nervous, propulsive piece for low horns, a stark string and piano combo, percussive synths and electric guitars, which eventually introduces the score’s one recurring thematic idea, a descending-ascending motif for violins. As far as main themes go, this one is slight and generally forgettable, but is does make a couple of other fleeting appearances here and there during the body of the score, notably in “Gotta See Your Boss” and “Shift Enter”, before recurring prominently during the conclusive cue, “Aftermath”. The action music, in cues such as “Warrant/Foot Chase”, the latter half of “Stone’s Headache”, “Operation Prophet”, “Gotta See Your Boss”, and “Shift Enter”, is fairly standard techno-thriller stuff, with lots of energy and movement, a heavy synth overlay to keep the beat and remind the listener of the film’s futuristic setting, a few bombastic brass punches to put some meat to the bones, and clamoring strings adding to the sense of urgency. It’s decent enough, achieves its aim of adding a level of excitement to the proceedings, and the sustained level of kinetic force which runs through the entirety of “Warrant/Foot Chase” is actually quite impressive, but for some reason it never quite raises itself to the levels fans of this type of scoring appreciate the most. Once or twice Marvin introduces an interesting orchestral technique into the mix – the trumpet triplets in “Warrant/Foot Chase” or the mewling guitars down in the depths of “Operation Prophet” for example – but despite this the music never properly connects, and is never engaging enough on a purely visceral level to be truly memorable. One romantic interlude comes in “I Want You”, a lovely piece for moody strings and a hesitant piano which is clearly intended to underscore Bruce Willis and his cinematic love interest. Beyond these few highlights, though, most of the rest of the score is fairly standard ambient electronica combined with shifting string tones and an occasional electric guitar. A piano adds a bit of lonely pathos to “Greer’s Apartment”, there’s a palpable sense of unease in “Stone’s Headache” that comes through the use of very low end instruments (and which occasionally reminds me of the some of the more dissonant textures of James Horner’s Aliens), and there’s a clear homage to Holst in “Shift Enter”, but after that I’m struggling to pick things out. I actually feel quite disappointed that I don’t like Surrogates more than I do, because Richard Marvin is a talented guy, I liked U-571 a lot, and I’m pleased he’s making a semi-comeback to the big screen, even if it is only Jonathan Mostow who seems to hire him. Fans of techno-thrillers like Eagle Eye or high concept sci-fi movies like I Robot might glean some enjoyment from its high spots, but overall Surrogates really doesn’t have enough of those aforementioned high spots to warrant frequent revisits. 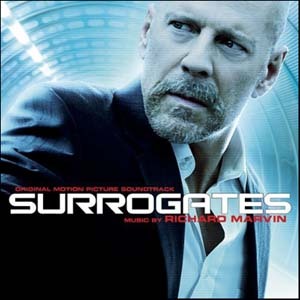 The soundtrack for Surrogates is not currently offered for purchase, and is available only as a promo released by Marvin’s publicists at Costa Communications; a download-only release through Amazon has been announced for later this year. The track listing of that commercial release may differ from that of this promo. Music composed and conducted by Richard Marvin. Orchestrations by Rick Giovinazzo and Kevin Kaska. Recorded and mixed by Thomas Vicari. Edited by Ryan Rubin and Scott Stambler. Album produced by Richard Marvin.